The phrase “Carpe Diem,” meaning “seize the day,” was made famous by Robin Williams in Dead Poets Society and I still remember when I first saw that movie in school. I think I remember the teacher screaming at us Carpe Diem! Carpe Diem! Well I seized the day and ended up at Carpe Diem, located just to the north of the 14th Street Viaduct on Grand Street between 14th and 15th Streets. 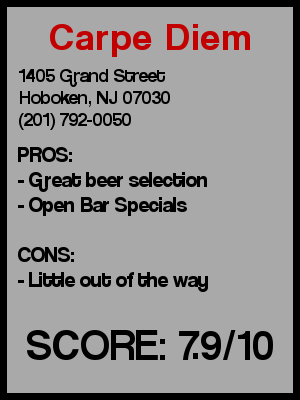 The bar is located in an up and coming part of Hoboken, near a new movie theater and near some new residential buildings in the northwest corner of the city. However it is also close to the bus depot and some other industrial buildings so it seems a little out of place for what turned out to be a pretty nice place. I walked into Carpe Diem at a quarter to five on a Saturday afternoon. We only really had time for one drink, so I took a look at their list of bottles that were prominently displayed on a chalkboard above the bar. I am a huge fan of bars that show off their beer list so that you can pick out your beer without having to bother the bartender to list all of the available beers on tap. Most of the time when you ask a bartender what beers they have, they end up rushing though a list while turning away, quickly making a drink for someone else. And undoubtedly they will forget one, or you will jump and make your decision right before you hear one of the better beers. So I randomly picked one from the list and decided on Leinenkugel’s Sunset Wheat. Having never had it before I thought it was going to be like a normal Hefeweizen, but it ended up being a very fruity beer. In fact as one of my friends pointed out, it tasted a bit like fruity pebbles or Trix (silly rabbit, alcoholic Trix in a bottle is not for kids). 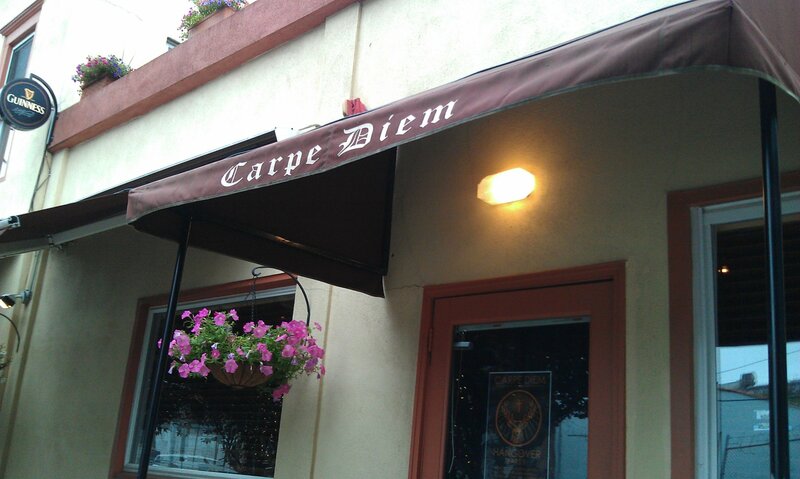 Despite it being off the beaten path in Hoboken, a lot of my friends have been to Carpe Diem before. Apparently they have a nice upstairs room that people can rent out for private parties and they host a $30 (or $35) open bar for all partygoers, so it’s a prime spot for birthdays. 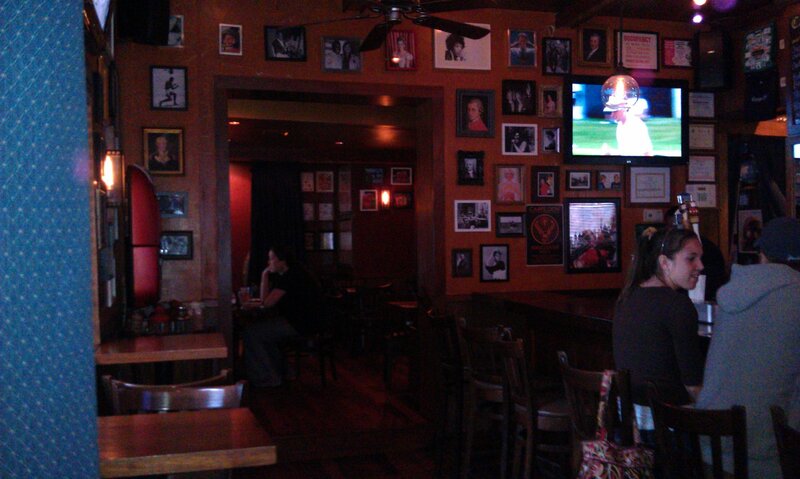 The downstairs is nicely decorated with hard wood walls lined with random pictures, photos, and posters. We sat at one of the 5 or 6 high top tables they have around their small bar room near the bar which seats around 8-10. There is also a side room that some people were grabbing an early dinner at, as well as some outside seating that wasn’t being used because it was drizzling out. Preconceived notion – I thought it was going to be a dive considering its in a developing neighborhood. Bar Type – Irish Bar. Crowd stereotype – 30 and up when we were there, but I imagine the crowd gets younger when the night rolls on and the open bar specials start. Music – Heard some Fun Lovin’ Criminals and Beastie Boys so there was some nice early 90’s rap. Value – There were no specials while we were there but they do have happy hour during the week ($2 off draughts) and the open bar deal seems like it’s great value. Date – Pretty good place to grab a drink after seeing a movie. Hookup – When there is an open bar, that’s always a possibility.